The PopLok is the industries leading tray forming machine to automatically fold and tuck die cut trays. Engineered to the exact needs of our customers, each PopLok is built with pride, care and the up-most attention to detail. 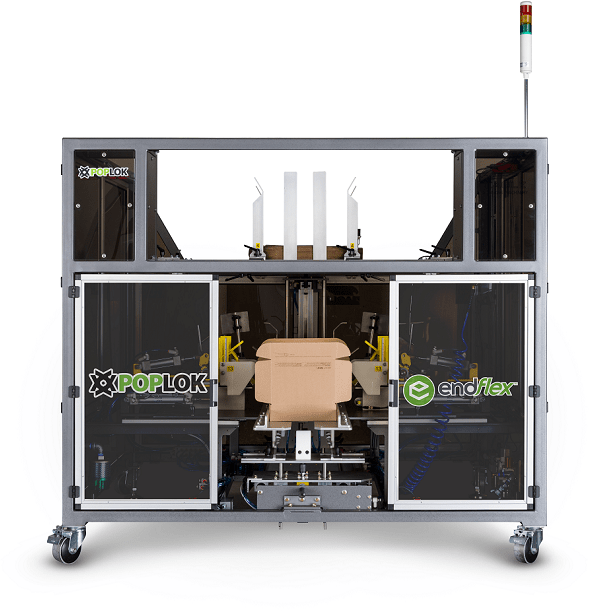 Ideal for packaging electronics, food, consumer goods, apparel, pharmaceuticals, hardware and more, the PopLok is easy to use and does not require expensive change parts (no mandrel needed) for multiple tray sizes. Stop folding trays by hand and consider the PopLok. Designed to take a tray blank, one at a time, from the hopper, and pull it through forming plows, erecting the side and end panels of the tray, while at the same time folding in the minor flaps. When the tray reaches the bottom of the vertical travel, a set of pneumatically controlled bars fold and lock the roll-over flap in place. The finished tray is then ejected from the machine. Large corrugate blanks from the top of the X-Lift hopper are transferred with a servo-driven handling mechanism to the folding and forming section of the machine. When the transfer mechanism is in place, a set of vacuum cups takes the blank and pulls it through forming plows, erecting the side and end panels of the tray, while at the same time folding in the minor flaps. When the tray reaches the bottom of the vertical travel, a set of pneumatically controlled bars fold and lock the roll-over flap in place. The finished tray is then ejected from the machine.